There’s not as much as usual, because last week’s Facebook outage sacrificed a whole day’s worth of curation. Sorry, but it’s still the easiest way for me to track my online reading. Nina Munteanu explains how to stoke the scintillation of inspiration. Alexa Donne tries to help you figure out if you’re a good writer. Mary Hynes: when hope is “punk” and grudge is forgiveness. “Tapestry” on CBC. And that was Tipsday. Come back on Thursday for some fuel for your thoughts. Until then, be well, my friends! And here I am, back with your weekly dose of informal writerly learnings. Elizabeth Huergo honors Mary Oliver on Writer Unboxed: walk slowly and bow often. Becca Puglisi guest posts on Jerry Jenkins’ blog. Got subtext? Writing better dialogue. I hope you found something you need to fuel your creative efforts this week. Come back on Thursday to get your weekly batch of thoughty. Jane Friedman shares three principles of finding time to write. Then, Grant Faulkner joins Jane to help you overcome creativity wounds. Jami Gold: how to save a broken story. Cold Crash Pictures takes a look at the five most annoyingly sexist tropes in movies. Works for fiction, too. That was Tipsday for this week. Come back on Thursday for your weekly dose of thoughty. Kristen Lamb: conflict is the elixir of the muse, creating timeless stories readers can’t put down. Join me over at DIY MFA for my latest Speculations column. The science in your science fiction: conventional space travel. Jami Gold compiles her master list of line editing skills and her master list of copy editing skills. I saw the headline and thought, sweet Jesus, kid lit too? The only way we’ll overcome systemic sexual harassment is to expose it and talk about it. Like human beings. Sexual harassment in the children’s book industry. Anne Ursu for Medium. Jim C. Hines, ally and sensible human being, writes about #metoo, denial, and backlash. I hope you found something to help you get to the next level. Later in the week, Kate continues her series on the do’s and don’ts of storytelling according to Marvel with a look at Guardian of the Galaxy, volume 2: how to ace the first act in your sequel. As a follow up to her last post on critiquing, Jane Friedman helps you recognize patterns in the way you respond to criticism. Then, Gary Zenker guest posts on DIY MFA: a new approach to critique. Larry Brooks stops by Writer Unboxed to discuss the big lie about writing compelling fiction. Abigail K. Perry joins the DIY MFA team: how to make you character descriptions do double duty. Gabriela Pereira interviews Sarah Dessen for DIY MFA radio. Jami Gold gives us one simple trick to avoid the opening page infodump. Then, Janice visits Writers in the Storm: what do you want your readers to wonder about? Folklore Thursday takes a look at how iron became the enemy of the fairy folk. And that is how we Tipsday. See you on Thursday for some mental corn popping thoughty. Learning to edit your work is learning to know when to let go. Maybe that’s what this workshop should be called: Let it go. This is what I do. You don’t have to do what I do. Do what works for you in your process, but I hope you’ll find some interesting tips and techniques you can incorporate into your process. Prose editing is fine tuning: Spelling, grammar, syntax, usage. Revision is substantive, structural, plot-related. To start the editing process, you must have a completed piece of writing. What was your intention in writing the piece? That core intention will guide you in the editing process. Overused or repetitive words. First identify them. Everyone has her or his words. Then, use find and replace to address them. Useless words (Mel’s note: also called zero words, because you can remove them from the sentence without changing the meaning of it) such as, just, only, that, actually, etc.. If you’re not sure what useless words are, Google it. Passive language. Examples: The biscuit was eaten by the dog (the dog ate the biscuit). She was jumping up and down (she jumped up and down). Telling versus showing. Telling has its place, but avoid it where possible. Check your use of adverbs, adjectives, and clichés. These are often signs that you are telling, rather than showing. Dialogue. Tags – do you need them, or would an action beat be better? Do all of your characters sound the same? Said is just fine. Read it out loud to see if it “sounds” right. I start with editing first, because I find it easier. Some writers may not want to do this because it may mean too many wasted words when the revision stage is reached. Editing first works for me. Where does the story begin? Is it too early, too late, is there enough action, conflict? The protagonist. What does he want? What prevents him from getting it? Other characters. If you can take her out of the story and not alter it, she should go. Every character should serve the story. Every character should be real, have a background, desires and frustrations of her own. Keep track of plot and subplots. Structure. Description. Is there too much or not enough? Flashbacks. Do they stall the story? Is the ending satisfying? Is it a resting place? Focus. No distractions. Space. Set time, page number, or word count goals. Separate new writing from editing and revision. Could be different times of the day, or different days. Revision iteratively. Editing as you’re going. Must always make progress, however. S.J. 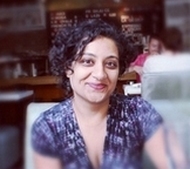 Rozan’s method of Iterative Revision – Bookbaby. Start with previous day’s work, and then move on. It’s like a progressive spiral. Change perspective. Step away. Change your font. Read aloud. Print it out. Draw maps. Pretend you are a reader. Create a visual outline. Literally cut and paste your scenes and chapters. Write a synopsis or jacket copy. Write a logline or tagline. Write a poem. Find your theme. When is the best time to obtain a critique? Be specific about what you want/need. Stay general. When did you stall, get bored, get lost? Receive your critiques without resistance. Set it aside. Decide what rings true. Ask for clarification (do not defend). The rest of the workshop was spent reading and responding to the participants’ works-in-progress. I must admit, I haven’t thought of purposefully editing first. I have edited too early before, and regretted spending all that time fixing scenes and even chapters that I would eventually delete. For me, I would think that revising first makes more sense. Similarly, iterative revision doesn’t work for me. I get caught in an endless loop of going further and further back. It doesn’t prime the pump for me, it engages my inner editor too early in the writing process and stalls me. Overall, I found Farzana’s workshop informative and practical. I hope that you, too, will find something useful that you can use in your daily practice. AG: I’m executive editor at Penguin Random House (A.K.A. Random Penguin) working with high profile clients such as George R.R. Martin and Connie Willis. MT: Author and freelance editor. MM: I’m editor for ChiZine’s book imprint and I do some freelance work on the side. KD: I’m an author, creative writing teacher, and more recently, a freelance editor. What’s the biggest misconception writers have about editors? AG: People don’t think editors edit anymore. I have to love a book if I take it on. I may read it as many as fifteen times in the editing process. I really have to love it. MT: Stephen King says in his On Writing that he edits once, and the book is ready. This is not what usually happens for most writers. When I submitted my manuscript, I assumed it would come back heavily marked up with specific direction. This did not happen either. I had submitted a 160k word draft and was told there was an 80k word story hidden in it. I was asked to cut 60k words. The book is the intellectual property of the author. Editors won’t muck around in it. Their aim is to help the author turn the novel into the best book it can be. It’s a very hands off process. MM: Good editing is completely invisible. There are different types of editing: the substantive, which is global and concerned with structural issues. Does the book work? Then, there’s line editing. This is a closer look at consistencies and story logic. Finally, there is copyediting. At this stage, when large chunks of the text will not be disappearing, errors are covered, line by line. KD: You have to be careful with self-publishing. With ebooks, unqualified editors make for a poor product. A good freelance editor will ask for a sample of your writing first. They have to like it. You have to be able to trust them with your work. AG: I’ve sent out 20-35 page editing letters in the past. That’s love. MT: Are established authors edited as thoroughly as newer authors? AG: They are if their editor is good. AG: If you’re my client, you may not like my solutions, but you have to concede that this particular aspect of your novel isn’t working. We can talk about other solutions, but what isn’t working has to change. Bottom line. KD: Fact-checking is critical. I edited a SF time-travel novel set in renaissance London. One of the main settings used was the Tower of London. Not all of the building existed at the time. I asked the author to do more thorough research. Then the manuscript was submitted indicating that there were balconies on the White Tower. This was again, not the case. I sent it back a second time. This may be an extreme example, but even he improved and now he’s one of my favourite people to work with. MM: Do not depend on Wikipedia for your research. MT: You have to be willing to do as much work on the research as you are willing to work on revisions and rewrites. MM: Editors are not inviolable. Stick to the heart of your story. Defend it if you need to. KD: With another book I was working on, the author wanted to send the manuscript to her uncle, who turned out to be Jack Whyte. Jack edited extensively, but he edited to the way he wrote. He threatened the author’s voice. I had to step in and defend her work. AG: We are champions for our authors. Q: What is the value of beta readers? AG: It can be helpful. You have to trust them, though. They have to be objective and they should have some expertise in what you’re writing. KD: “I like that” is not constructive. The best beta readers are not going to be your family or friends. MT: Asking your friend to beta-read for you isn’t fair. They feel obliged to like your work. MM: If you hire an independent editor, never ask them to edit multiple versions of you manuscript. You’ll never earn back what you pay them. Q: What should an author look for when hiring and independent editor and how much should you expect to pay? KD: Look for education, a degree in a related field, experience, and ask for references. Most editors will ask for $1.50 to $2 per word or a maximum number of pages. MM: Some also charge a flat rate. MT: Get the recommendation of a writer you trust. Every writer has a shelf of “learning novels.” If you read early Bradbury, you can see the difference between that work and his more mature novels. KD: Trunk novels can be rewritten, though. Q: As an editor, how do you improve? AG: Learn to cut. The two Connie Willis novels Black Out and All Clear originally came to my desk as a 300k word draft. MM: Work as a slush reader or apprentice at a publisher. KD: Work as an assistant editor. MM: You learn to establish a collaborative relationship with your authors. MT: What happens when you establish that relationship and they then hand in crap? And that’s it for the session. There are only three more sessions for me to transcribe and then I’ll write a wee wrap up piece. Overall, Ad Astra was well worth the trip. It will probably be one of my staple conventions from here on out. 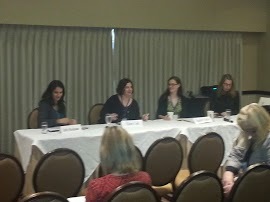 This was a fun panel with an author, an agent, and two editors. They took us through the publication process at each stage, author, agent, and editor explaining how their part of the puzzle looks. Then they fielded questions. I’ve attended panels before that featured all publishers, or all editors, or all agents. While informative, how everything dove-tailed was missing. Occasionally, panelists might say that they couldn’t comment or speculate on what others in the process might do or experience. Panelists: Emily Ohanjanians, editor with Mira Books, the commercial fiction imprint of Harlequin; Eileen Cook, author of YA novels with Simon & Schuster and HarperCollins; Rachel Coyne, agent with Fine Print Literary; Sara Sargent, associate editor with HarperCollins’s children’s imprint, Balzer & Bray. EC: We’ll start with the author’s search for an agent. First you have to understand what an agent does. Most are busy with their current authors and are not actively looking for new authors. Do your research to find the best fit. Newer agents will be more available. Ultimately, it comes down to personal taste. One agent may not like your voice or style, but another might love it. RC: I receive 150 to 300 queries per week. It’s impossible to respond individually. When I started, that was my intention, but it just can’t be done. Agents get rejected too, by editors. There’s a certain disappointment when another agent snags an author from you, especially one that receives an award or does really well. After I’ve agreed to take on an author, we have a one on one call to discuss next steps. There is a two page author agreement. It’s not a contract per se. Standard percentage is 15% for domestic sales and 20% for foreign, TV, film, and other rights. Most houses have one agent who is dedicated to subsidiary rights. Once an author has signed on, the editing begins. This could mean several rounds, back and forth. Then the agent will submit to her first round editors. Usually these are people the agent has an established relationship with. Sometimes, if several editors are interested, an auction takes place. SS: At HarperCollins, there are several meetings, one with the acquisitions team during which a profit/loss statement is generated. The agent is advised of the proposed deal, and negotiation begins. At the acquisition meeting, everyone sees the property. EO: It’s the same at Mira, the meeting with the editorial director is followed by the acquisition board meeting, the agent is informed of the proposed deal, and negotiation follows. Q: Once the book is sold, what happens? RC: I would make recommendations to the author based on what they hope to achieve. Usually there is a year between the deal and the publication date, so there is time to implement an author web site or blog, develop social media following, or begin on the next book. The contract can take anywhere from two weeks to nine months to hammer out. An advance might be $10,000. Royalties could be 10%. First you earn back your advance, then you begin to receive regular cheques. Q: How does the editor work with the writer on further revisions? EO: When the launch date is decided upon, it might be a year, or a year and a half, we work backwards, get our endorsements in place, schedule substantial, line, and copy edits, proofing, typesetting, cover art, blurbs, back cover copy, determine the meta data for online sale. Q: So what happens when you write an editorial letter for the writer, and the writer refuses to budge? SS: Usually I’ll read and mark up the copy, then prepare a three to ten page editorial letter for the author. The author will usually sit with it for a few days, then I’ll meet with the author by phone and the author will indicate what they are willing to do and what they are not. The biggest issue that comes up is characters that are not received as the author intended. The next is the market: similar books may have tanked for specific reasons that have nothing to do with the quality of the writing. EC: We work together to reach a solution. e.g. I hate the character! My character is brilliant! How do I show it? RC: The biggest asset a writer can have is the willingness to be edited. I like to meet annually with my authors to find out what their plans are for the coming year. Q: Describe your ideal author. EO: An insecure author can become overwhelming. 20 emails a day can be draining. An author coming out of another house might cause me to do some research. Were there reasons for this? EC: You have to own your neuroses as an author. You must be open to communicate. Q: If your author had to choose between a Canadian and American publisher, which would you recommend? EC: Commission can be less with a Canadian publisher. Most American publishers will include Canadian distribution. The deal is for North American rights, not Canadian or American. Canada is not considered a foreign market. Really, your agent is a match-maker, trying to find the best possible home. It used to be that agents had to be in New York, now they can be anywhere. RC: There is a right agent and a right publisher for every author/project. SS: They are considered subsidiary rights. Q: How often do you have to meet in person? RC: Never if you don’t want to or can’t afford it. Q: What is your education/experience? SS: Placement with Disney/Hyperion, BA in English, then an MA in Journalism. RC: Writer’s Digest Books, Donald Maass Agency, Forward Literary, then Fine Print Literary. EO: BA in English literature/linguistics, job in finance, but I always wanted to be an editor. I started working for magazines, then got on with Harlequin, took some courses from EAC and Ryerson in editing, and at every stage, working up through the ranks. Q: What’s the difference for non-fiction? EO: It’s based entirely on platform. Not voice. Not skill. Who’s the audience for the book? RC: Blog-books have been happening recently as well. Narrative non-fiction works the same as fiction. EC: With a novel, you have to have the novel completed before you can query. RC: With non-fiction, a proposal and platform is often enough. Q: What should your word count be, and do you talk about series? SS: Word count isn’t critical. I’ve never rejected a book on the basis of length. You should concentrate on one novel per query and treat it as a stand-alone. It’s important to have a vision, though of how your writing future will look. RC: We’re not looking so much at the concept, but the creativity of the author. SS: With children’s literature, you have to be aware of the market. EC: Not many YA novels are 300,000 words long, but submitting a 20,000 word novel would be too short. Q: Can an author ever go direct to editor? EO: If I have the time, I’ll always look. Why not? I could find a gem. Q: When do you know when to stop editing and query? EC: Write the best book you can. No matter what you write, you can find an association (RWA, SFWA, etc.). These associations will often offer editing services, or members can serve as critique partners and beta readers. When you do query, send out five at a time. Q: Is a rejection a burned bridge? RC: Not necessarily. If you revise and resend, there’s a chance that the agent will not remember, but if they do, they are not likely to give you a second chance. It’s better to try a new project. Q: How long is it for an editor to respond to an agent? RC: Between three months to a year sometimes, but the average is three to four weeks. If there is a closing date or an auction, all interested parties are called. Q: Do agents want to have input into the author’s platform? RC: It’s more a matter of making suggestions, showing examples. SS: In concert with publicity and marketing, publishers may advise. But if you’re not comfortable on Twitter, you don’t have to use Twitter. EC: Some agents will advise you with regard to your career in general. Some agents will never go there. Q: Have there been books you just couldn’t sell? RC: Every agent has a book that they felt passionate about, but just couldn’t move. I make every effort to sell every project, but between 60% and 90% of books signed actually sell. EC: Hopefully you have more than one book in you. EO: It’s often the second submission that sells. RC: Some projects are bought on voice alone. Q: If you’ve self-published, is it a deal-breaker? RC: Only if it’s the self-published effort and it’s not sold well. If it’s a different effort, no problem. EC: They call us hybrid authors now. Q: How about posting your work in progress on the internet? RC: It depends on how much of your novel is out there, and at what stage. If most of the novel is already “published,” I probably wouldn’t take it. Do not blog your book. Q: Can you self-publish one book and e-publish another? Specifically, the rights on my first novel are reverting to me and I’d like to self-publish. Meanwhile, I’m in negotiations for my second book. EC: If your first book is erotica and your second is YA, then they’re not likely to get in each other’s way. EO: If both books are comparable, you could offer the self-published book at a deep discount. RC: It would be wise to check with the publisher about to put out your second novel if self-publishing your first is okay. EO: Be up front with all interested parties. This brings us to the end of Friday’s sessions. I’ll have the Friday night and Saturday morning keynotes before moving on to Saturday’s sessions. We’ll see how far I get tonight. I’ll be travelling home tomorrow and won’t finish off whatever remains until Tuesday.